As a Far East of Asian Researcher my focus on Japan is “Japanese Mythology” from 2013 till present time. I have worked with Portico Library in Manchester and registered as their researcher to develop my research by using their limited edition resources. I continued working on my research with Japan Society of North west (JSNW) till present. I strongly believe that there is a big need for producing more works as both visuals, scripts and essays to raise the knowledge on Japanese Mythology which has an old strong root with the amazing history of Japan, which made it to be such an incredible nation. Japan always was one of the successful countries and I am really interested to show the West, specially UK, the depth of the history and specially the beauty of the ancient mythology such as Kojiki that unfortunately have never introduced well to the UK. My mission is to make that bridge to show the importance part of Japanese Mythology and introduce depth of the history which will show why this country is so powerful and how the whole nation helped to achieve these successes which was not east and it has the incredible foundation of ancient stories. My main research which I did not include here (because of copyright) looked deeply into mythology of Japan and what information of never been introduced that also are the b ig and important of Japan history and how it effects Japan’s culture in years till now. I am also honoured and excited from the time I started this research to get to know more about Japan which leads me to start studying Japanese Language which I am in year one and it will support me and my research to access to more Japanese resources. Please go to contact me if you have any questions or want to read my visual works and essays. And also the effect of characters in Japanese culture and life style mostly animation and manga is very important to me. The depth of the each characters, their personality and stories has the big impact on the Japanese cinema and and media productions. Working on Kojiki was so interesting for me and I love the powerful start of deities and the rest of the book make you believe the characters in a very strong way and it’s because each character have the good foundation of supernaturals which satisfied the curiosity in human nature. One of the main characters I worked was “Amaterasu” which I put the link above to my visual production and her story. I will update the blog with more news soon! P.S Latest news on 2016 is planning for a Digital Innovative performance for Japan Day 2018 in Manchester based on Japanese Mythology. the meeting with Japan Society of North west (JSNW) and Mrs Yuko Howes took place which was positive. I will had few meetings with the director of Community Arts North West (CAN) in mid of September. Sara Domville which is the creative Producer for CAN will also loved the idea and she will join us to plan the funding application soon. I am really excited to take this project start in 2017 (probably May, will confirm it in 2 month) and also I had the opportunity to do two directing courses to enhance my directing and theatre production skills with HOME MCR, after discussing the idea of Digital Performance for Japan day and they were impressed and agreed to support me. I invite you to have a look at some of the Mythology characters, and some part of my research which I saw that these are the available resources in English that unfortunately are not entirely correct and also Mrs Howes helped a lot to correct the parts which the stories were different from the actual original stories. These articles and information are the best evidence and encourage for me to pursue my research to bring the correct and true original resources to show the amazing root and foundation of the Japanese history and mythology. Activities from this demon can range from mischievous to deadly. It enjoys passing gas and forever gives off a fishy odour. It may also try to look up women’s kimonos and swim down the plumbing to stroke a persons bottom as they defecate. Else they will overpower a person or animal to drown them. Once drowned they remove a person’s entrails through their backside, favouring the liver or something the Japanese call the shirikodama.Besides fresh flesh, the kappa also partakes in vegetarian cuisine. It enjoys eggplants and cucumbers. It is said carving your name and age into a cucumber, then throwing it into the water for a hungry kappa, will ensure that kappa cannot harm you. Though it is also dangerous to swim soon after eating a cucumber.Kappa also loved contests. They would challenge passersby to such games as pull-my-finger and sumo wrestling. Should the demon win, they usually drowned and ate you. One tale tells of a samurai who accepted a kappa’s request for tug-of-war. Fortunately he outsmarted the kappa and used a horse to pull in his stead. The outmatched demon fell, spilling the contents of its head upon the ground. Now too weak to get away, the kappa promised to teach the samurai the trick of bone-setting if it could be released.Many kappas have proven to be quite knowledgeable on subjects of medicine and irrigation. In a case where one kappa lost its arm to a frightened horse, it petitioned the villagers for the limb’s return. The community forced the kappa to sign a contract with its webbed hand. From then on the kappa delivered to the village piles of fish, and warned of other kappa passing through the area. The Kojiki is one of the two primary sources for Shinto, the Japanese national religion. It starts in the realm of myth, with the creation of Japan from foam. Innumerable gods and goddesses are described. The narrative moves from mythology to historical legends, and culminates in a chronology of the early Imperial line. The book is densely footnoted, almost to the point where the text is buried in apparatus. However, even this cannot shroud the wonderful story-telling. There are supernatural episodes, and tales of murder, passion and betrayal, all interspersed with extemporaneous poetry, reminiscent of Icelandic sagas. Production notes: I worked on this for four years, on and off. I searched for a long time to locate a copy of the Tuttle reprint of the Chamberlain translation, which, despite being published in the 1970s is out of print and hard to obtain. In 2000, a copy fortuitously turned up in a local used bookstore. However, limitations of OCR technology at the time made it difficult to proof the text, so I put it aside. In 2005, I rescanned the book using more recent OCR software with better results, and managed to complete the proof. Even still, it took quite a bit of work to finish the job, particularly creating bitmaps of hundreds of images of Chinese and Japanese characters. [paragraph continues]  and the traditional history of Ancient Japan. Indeed it is the earliest authentic connected literary product of that large division of the human race which, has been variously denominated Turanian, Scythian and Altaic, and it even precedes by at least a century the most ancient extant literary compositions of non-Aryan India. 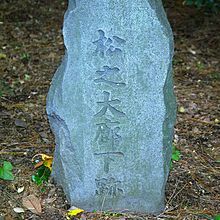 Soon after the date of its compilation, most of the salient features of distinctive Japanese nationality were buried under a superincumbent mass of Chinese culture, and it is to these “Records” and to a very small number of other ancient works, such as the poems of the “Collection of a Myriad Leaves” and the Shintō Rituals, that the investigator must look, if he would not at every step be misled in attributing originality to modern customs and ideas, which have simply been borrowed wholesale from the neighbouring continent. who reads all such books, not as a pastime but in order to search for facts, will prefer the more genuine composition. It is also accorded the first place by the most learned of the native literati. at has been a rigid and literal conformity with the Japanese text. Fortunately for this endeavour (though less fortunately for the student), one of the difficulties which often beset the translator of an Oriental classic is absent in the present case. There is no beauty of style, to preserve some trace of which he may be tempted to sacrifice a certain amount of accuracy. The “Records” sound queer and bald in Japanese, as will be noticed further on, and it is therefore right, even from a stylistic point of view, that they should sound bald and queer in English. The only portions of the text which, from obvious reasons, refuse to lend themselves to translation into English after this fashion are the indecent portions. But it has been thought that there could be no objection to rendering them into Latin,—Latin as rigidly literal as is the English of the greater part. I.—Authenticity and Nature of the Text, together with Bibliographical Notes. II.—Details concerning the Method of Translation. IV.—Manners and Customs of the Early Japanese. V.—Religious and Political Ideas of the Early Japanese. Beginnings of the Japanese Nation, and Credibility of the National Traditions. Kanamaruza Theater, a traditional kabuki theaterKabuki (歌舞伎) is a traditional Japanese form of theater with roots tracing back to the Edo Period. 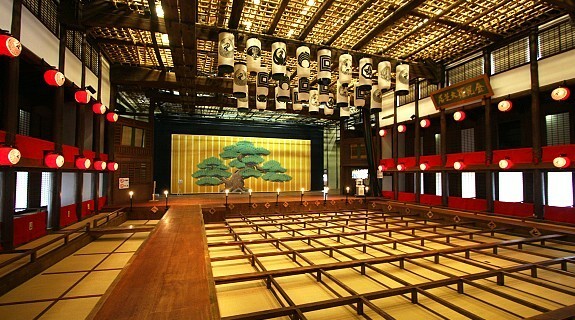 It is recognized as one of Japan’s three major classical theaters along with noh and bunraku, and has been named as a UNESCO Intangible Cultural Heritage. Kabuki is an art form rich in showmanship. It involves elaborately designed costumes, eye-catching make-up, outlandish wigs, and arguably most importantly, the exaggerated actions performed by the actors. The highly-stylized movements serve to convey meaning to the audience; this is especially important since an old-fashioned form of Japanese is typically used, which is difficult even for Japanese people to fully understand. 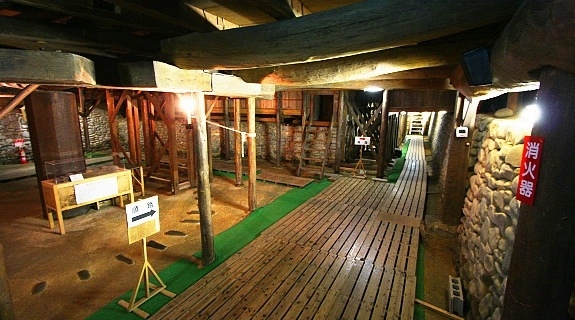 Dynamic stage sets such as revolving platforms and trapdoors allow for the prompt changing of a scene or the appearance/disappearance of actors. Another specialty of the kabuki stage is a footbridge (hanamichi) that leads through the audience, allowing for a dramatic entrance or exit. Ambiance is aided with live music performed usingtraditional instruments. These elements combine to produce a visually stunning and captivating performance. Plots are usually based on historical events, warm hearted dramas, moral conflicts, love stories, tales of tragedy of conspiracy, or other well-known stories. A unique feature of a kabuki performance is that what is on show is often only part of an entire story (usually the best part). Therefore, to enhance the enjoyment derived, it would be good to read a little about the story before attending the show. At some theaters, it is possible to rent headsets which provide English narrations and explanations. When it originated, kabuki used to be acted only by women, and was popular mainly among common people. Later during the Edo Period, a restriction was placed by the Tokugawa Shogunate forbidding women from participating; to the present day it is performed exclusively by men. 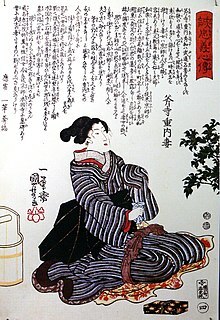 Several male kabuki actors are therefore specialists in playing female roles (onnagata). One of the things that will be noticed are assistants dressed in black appearing on stage. They serve the purpose to hand the actors props or assist them in various other ways, in order to make the performance seamless. They are called “kurogo” and are to be regarded as non-existent. If you come across people from the audience shouting out names at the actors on stage, do not mistake this for an act of disrespect: all kabuki actors have a yago (hereditary stage name), which is closely associated to the theater troupe which he is from. In the world of kabuki, troupes are closely knit hierarchical organizations, usually continued through generations within families. It is an accepted practice for the audience to shout out the actors’ stage names at an appropriate timing as a show of support. Formal dress code is not required when attending a kabuki play, although decent dressing and footwear are recommended. Sometimes, often on the first day of a run, some ladies dress in traditional kimono. In the olden days, mainstream kabuki was performed at selected venues in big cities like Edo (present dayTokyo), Osaka and Kyoto. Local versions of kabuki also took place in rural towns. 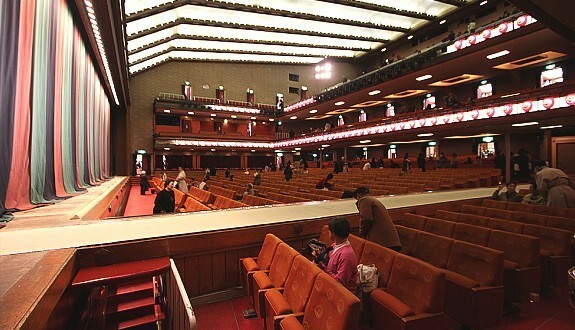 These days, kabuki plays are most easily enjoyed at selected theaters with Western style seats. A day’s performance is usually divided into two or three segments (one in the early afternoon and one towards the evening), and each segment is further divided into acts. Tickets are usually sold per segment, although in some cases they are also available per act. They typically cost around 2,000 yen for a single act or between 3,000 and 25,000 yen for an entire segment depending on the seat quality.